Kelowna is a city on Okanagan Lake in the Okanagan Valley in the southern interior of British Columbia, Canada. It serves as the head office of the Regional District of the Central Okanagan. The name Kelowna derives from an Okanagan language term for "grizzly bear". The Kelowna metropolitan area has a population of 194,882; the third-largest metropolitan area in the province, behind only Vancouver and Victoria. Additionally, the City of Kelowna is the seventh-largest city in the province. 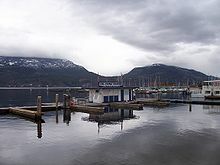 It ranks as the 22nd-largest in Canada and is the largest city in British Columbia that is located inland. 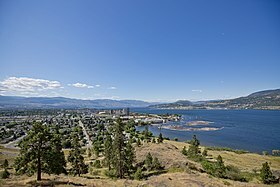 Kelowna's city proper contains 211.82 square kilometres (81.78 sq mi), and the census metropolitan area contains 2,904.86 square kilometres (1,121.57 sq mi). In 2016, the population of Kelowna consisted of 127,380 individuals occupying 53,903 private dwellings. Nearby communities include the City of West Kelowna (also referred to as Westbank, Westside) to the west across Okanagan Lake, Lake Country and Vernon to the north, and Peachland to the southwest, and further to the south, Summerland and Penticton. Exact dates of first settlement are unknown, but a northern migration led to the peopling of this area some 9,000 years ago. The Indigenous Syilx people were the first inhabitants of the region, and they continue to live in the region. Father Pandosy, a French Roman Catholic Oblate missionary, became the first European to settle in Kelowna in 1859 at a place named "L'anse au sable" (Bay of Sand) in reference to the sandy shoreline. Kelowna was officially incorporated on May 4, 1905. In May 2005, Kelowna celebrated its centennial. In the same year, construction began on a new five-lane William R. Bennett Bridge to replace the three-lane Okanagan Lake Bridge. It was part of a plan to alleviate traffic problems experienced during the summer tourist season. The new bridge was completed in 2008. Stubbs House is a historic house in Kelowna. On 3 July 1877, George Mercer Dawson was the first geologist to visit Kelowna. On 6 August 1969, a sonic boom from a nearby air show produced an expensive broken glass bill of a quarter million dollars while at least six people were injured. The incident was caused by a member of America's Blue Angels during a practice routine for the Kelowna Regatta festival: he accidentally went through the sound barrier while flying too low. The last time the lake completely froze over was in the winter of 1969 and it may have frozen over in the winter of 1986. On 25 November 2005, the First Ministers and National Aboriginal Leaders signed the Kelowna Accord. 2009, Kelowna built the tallest building between Vancouver and Calgary: Skye at Waterscapes, which is a 27-story residential tower. On 7 May 1992, a forest fire consumed 60 hectares of forest on Mount Boucherie in West Kelowna across Okanagan Lake from Kelowna proper; no homes were damaged, however. In August 2003, a nearby wildfire destroyed 239 homes and forced the temporary evacuation of about 30,000 residents. During the 2003 fire, many trestles of the historic Kettle Valley Railway were destroyed. All the trestles have been rebuilt to look like the originals, but using smaller dimension beams. In late August 2005, a 30-ha fire caused multiple evacuations in the Rose Valley subdivision across the lake in West Kelowna. In July 2009, wildfires destroyed hundreds of hectares of forest and a number of buildings in West Kelowna; 17,000 residents were evacuated. In July 2009, a 100-ha fire near Rose Valley resulted in the evacuation of 7,000 people. No structures were lost. In July 2009, a 9,200-ha fire behind Fintry resulted in the evacuation of 2,500 people. No structures were lost. On 12 July 2010, a 30-ha fire in West Kelowna destroyed one home and caused multiple evacuations. September 2011, a 40-ha fire in West Kelowna's Bear Creek Park caused the evacuation of over 500 people. In July 2012, a 30-ha fire caused the evacuation of the small community of Wilson's Landing just north of West Kelowna. In September 2012, a late-season, 200-ha fire destroyed seven buildings and resulted in the evacuation of 1,500 people in the community of Peachland. In July 2014, a 340-ha fire behind the West Kelowna subdivision of Smith Creek caused the evacuation of 3,000 people. In August 2014, a 40-ha fire above Peachland resulted in the evacuation of one home. In July 2015, a 55-ha fire in the Joe Rich area caused the evacuation of over 100 properties. In July 2015, a 560-ha fire near Shelter Cove caused the evacuation of 70 properties. In August 2015, a 130-ha fire burned near Little White Mountain just south of Kelowna. In August 2017, a 400-ha fire in the Joe Rich area caused the evacuation of over 474 properties. Kelowna's official flower is Balsamorhiza sagittata, commonly known as arrowleaf balsamroot. Kelowna is classified as a humid continental climate per the Köppen climate classification system due to its coldest month having an average temperature slightly above −3.0 °C (26.6 °F), with dry, hot, and sunny summers, cold, cloudy winters, and four seasons. The official climate station for Kelowna is at the Kelowna International Airport, which is at a higher altitude than the city core, with slightly higher precipitation and cooler nighttime temperatures. The moderating effects of Okanagan Lake combined with mountains separating most of BC from the prairies moderates the winter climate, but Arctic air masses do occasionally penetrate the valley during winter, usually for very short periods. The coldest recorded temperature in the city was −36.1 °C (−33.0 °F) recorded on 30 December 1968. Weather conditions during December and January are the cloudiest in Canada outside of Newfoundland due to persistent valley cloud. As Okanagan Lake hardly ever freezes, warmer air rising from the lake climbs above colder atmospheric air, creating a temperature inversion which can cause the valley to be socked in by cloud. This valley cloud has a low ceiling, however, and often bright sunshine can be experienced by driving only 20 minutes or so up into the nearby mountains, above the cloud. Summers in Kelowna are hot (sometimes extremely hot) and sunny, with daytime temperatures often exceeding 32 °C (90 °F). The hottest recorded temperature at the airport was 39.5 °C (103.1 °F) on 24 July 1994, and the highest temperature ever recorded in the city was 41.0 °C (105.8 °F) in August 1998, near but not at the airport. Not unusually, heat waves occur in July, August, and even June and September on occasion, where temperatures above 30 °C persist for weeks. During summer, clear, dry air allows night-time temperatures to fall rapidly. The city averages about 380 millimetres (15 in) of precipitation per year, with about 1/5 of the precipitation falling as snow, the bulk in December and January; however, June is the wettest month of the year. While some smaller communities such as Blue River and Golden get less wind, Kelowna has the greatest percentage of "calm" wind observations for any major city in Canada (39% of the time). The four-year average wind measured at the airport has been less than 5 knots on average 10/12 months of the year between 2008 and 2011. As shown in the climate chart below, Kelowna has an average high temperature that is above freezing every month of the year - an exceptionally rare phenomenon for a Canadian city located inland. In fact, average high temperatures in January surpass those of St. John's, Newfoundland, which experiences heavy moderation from the warm Atlantic current. Kelowna's average year-round high temperature of about 14.3° is also one of the highest in Canada - largely due to the rare combination of high summer temperatures typical of continental climates, along with relatively mild winters - a very rare feature of a continental climate. Kelowna consists of ten sectors with multiple neighbourhoods within the sector boundaries. Central City is a linear commercial sector extending along Harvey Avenue from the Downtown to Highway 33. Major commercial developments include the Capri Centre mall, the Landmark buildings, and the Orchard Park Shopping Centre. Commercial activity is particularly concentrated along or very near highway 97 (Harvey). Dilworth Mountain is a relatively low and isolated mountain which is located near the geographic center of the city. It lies across from Knox Mountain to the West, and forms part of the eastern heights between which Glenmore Valley lies. While technically a mountain, it rises about one thousand feet or so above the rest of the Okanagan Valley (just over 2,000 feet elevation). It has been very extensively developed in recent years; decades of blasting and construction work have resulted in a scenic collection of neighborhoods with suburban character but located only minutes from Central City. Like many other Kelowna residential districts, Dilworth has gone from relative isolation and wilderness to hosting many residential roads with hundreds of homes, many of which are considered fairly expensive and high-end. Downtown Kelowna is the centre of the city and is a tourist district. It is located alongside Okanagan Lake, and its area is officially defined as all land north of highway 97, south of Clement Avenue, east of Okanagan Lake, and west of Richter Street. There are two main routes through the downtown core along which various attractions and commerce are concentrated. These include several parks and beaches along the lake, boardwalks and other walking trails, Kelowna Marina and Yacht Club, Delta Grand hotel and casino, and Prospera Place arena. The other main route through downtown is Bernard Avenue from Richter street to the lake. It has more shops and restaurants designed both for locals and tourists. Although Bernard Avenue continues east well past the downtown area, it is not part of downtown and is zoned residential. The commercial segment lies within its downtown section between Richter and Abbott streets, the latter of which is lake-adjacent. Kelowna has declared a 1 km2 (0.39 sq mi) downtown area to be a "red-zone", an area of prolific drug trafficking, assaults, and robberies. The red-zone extends from Okanagan Lake to the West, Lake Avenue, Rowcliffe to Ethel and Ethel to Stockwell, Doyle and back to the lake. The red zone in Kelowna was put in place in 1992 to reduce street crime, and within it the RCMP conducts an annual "spring sweep", arresting low-level drug dealers. Kelowna was the second British Columbia city to declare a red-zone. Glenmore is a relatively affluent suburb that lies mostly within Glenmore Valley - a subsection of the Okanagan Valley in the Kelowna area. It has experienced extremely rapid housing development within the past two decades, changing from a small suburb with a relatively rural character to extensive suburban neighborhoods, including several elementary schools and a rapidly growing commercial hub. While most of the homes in this part of town lie on the relatively flat valley bottom, there are several large and more recent neighborhoods being built into the adjacent mountains; the community of Wilden is an example of this. The Midtown area bordered by Enterprise Way on the north and Springfield and Baron Road at the south is a popular shopping destination for the locals. The largest shopping mall in the interior, Orchard Park, is located in this area. Since most of the Midtown area consists of large, car-oriented big-box stores, Midtown is often criticized for its plainness, urban sprawl, and the decline of pedestrian-oriented Downtown. There is also a lack of green space, particularly since the whole area used to be a linear park and golf course. Known colloquially as "The Mission" or "Okanagan Mission" in order to differentiate itself from Mission, BC, a city in the Lower Mainland near Abbotsford, the Mission used to be a separate jurisdiction before being amalgamated with the City of Kelowna in the mid- to late-20th century. This has caused a fairly vibrant secondary commercial centre to emerge which is entirely separate from Downtown, with low to moderate density residential areas in between. It is often differentiated as the "Lower Mission" and "Upper Mission", the former of which contains most of the aforementioned commercial areas such as shopping malls, grocery stores, coffee shops, and boutiques. The Upper Mission begins to extend into the foothills and higher terrain, and many parts of this area boast magnificent views of the city, mountains and Okanagan Lake. As a result, this part of town is widely regarded as luxurious and is indeed one of the most expensive neighborhoods of Kelowna. It is not unusual to see homes worth one million dollars or more, the most expensive of which can reach 5 million or even slightly above. Rutland is Kelowna's largest neighborhood by far. Although the majority of the area sits on the valley bottom and is therefore relatively flat, the fringes continue up into the hills and are therefore built at higher elevations and possess more expansive views than the rest of the neighborhood; these homes are correspondingly more expensive. This is the exception, however, as the majority of Rutland is among the most affordable of Kelowna housing. There are also several low-rise apartment buildings which increase the population density relative to most other parts of town. Rutland was a town until it amalgamated with Kelowna in 1973, and this union has resulted in Rutland having a distinct commercial center with many shops and restaurants. An improvement and gentrification effort has been ongoing for the past decade, with new parks, widened sidewalks, bike lanes, a renovated YMCA, a rebuilt high school, and many new shops and condo buildings being added. The service industry employs the most people in Kelowna, the largest city in the tourist-oriented Okanagan Valley. In summer, boating, golf, hiking and biking are popular, and in winter, both Alpine skiing and Nordic skiing are favourite activities at the nearby Big White and Silver Star ski resorts. Tourism in the Greater Kelowna Area has now reached a $1 billion a year industry, as of 2016. Kelowna produces wines that have received international recognition. Vineyards are common around and south of the city where the climate is ideal for the many wineries. At least two major wineries were damaged or destroyed (now rebuilt) in 2003 due to the Okanagan Mountain Park Fire. Kelowna is also the home of Sun-Rype, a popular manufacturer of fruit bars and juices. Okanagan College and University of British Columbia are the predominant centres for post-secondary education. Over 5,000 students attend Okanagan College and 8,718 students attend the University of British Columbia. In addition to vocational training and adult basic education, the college offers a highly regarded university transfer program. University of British Columbia's Okanagan campus has a student population of over 8,000 full-time students enrolled in diverse undergraduate and graduate programs. Kelowna is the seat of the Regional District of the Central Okanagan, the third-largest metropolitan area in British Columbia after Vancouver and Victoria and the largest in the British Columbia Interior. With scenic lake vistas and a dry, mild climate, Kelowna has become one of the fastest growing cities in North America. The appropriate management of such rapid development (and its attendant consequences) is a source of significant debate within the community. Kelowna is the fourth least affordable housing market in Canada, currently maintaining the classification of "Severely Unaffordable". Because of the Okanagan's climate and vineyard-filled scenery, it is often compared to Napa Valley, California. The first state of the art soundstage and film studio in Kelowna was announced by Burnaby-owned Eagle Creek productions, with construction sometime in 2017. Fido, a comedy/horror/thriller movie about zombies, was filmed in Kelowna and debuted on 7 September 2006 at the Toronto International Film Festival. Part of the movie Mee Shee: The Water Giant was filmed in Kelowna. The movies Shred, and Shred 2 were partially filmed at Big White, a ski hill near Kelowna. Flicka: Country Pride, released in 2012, was filmed in Kelowna at several locations, such as Mission Creek Ranch, Kelowna Secondary School, and Gemstone Equestrian Centre. The Canadian Air Transport Security Authority piloted new whole body imaging technology for passenger screening at the Kelowna International Airport from 2008 to 2009. Telus Mobility re-launched its Clearnet discount mobile phone brand in Kelowna and Red Deer, Alberta in 2011. Kelowna was the first city in Canada to have a permanent Flow-Rider, located at the H20 Facility. Peachwave opened its first Canadian store in Kelowna in 2013. Overwaitea Food Group opened its first Urban Fare location outside of downtown Vancouver in Kelowna. As Kelowna has one of the most rapidly growing populations in Canada, its population statistics generally become out-of-date quite rapidly. According to the Statistics Canada 2011 census, the population estimates there were 117,312 people residing in Kelowna proper, and 147,739 people residing in the Greater Kelowna Area. 48.4% of residents were male and 51.6% were female. The predominant language spoken in Kelowna is English. More recent population estimates (as of 2014) give the Greater Kelowna Area a population of just under 200,000. Children under five accounted for approximately 4.8% of the resident population of Kelowna. This compares with 5.2% in British Columbia, and 5.6% for Canada overall. In mid-2001, 18.4% of the resident population in Kelowna were of retirement age (65 and over for males and females) compared with 13.2% in Canada; the average age is 41.1 years of age, compared to an average age of 37.6 years in Canada. In the five years between 1996 and 2001, the population of Kelowna grew by 7.7%, compared with an increase of 4.9% for British Columbia as a whole. Population density of Kelowna averaged 50.9 people per square kilometre, compared with Vancouver at 5,335 people per square kilometre, and with all of British Columbia with an average of 4.2 people/km2. Visible minorities make up about 6.2% of the population of Kelowna. The largest group of visible minorities are, in order of size, South Asian, Chinese, Japanese, Southeast Asian, Filipino and other Asian, Black, Latin American, multiple/other, and Arab. In February 2016, Statistics Canada released their latest census, stating that Kelowna's population had grown by 8.4% from 2011 to 2016. The population of the city proper had risen to 127,380 while greater Kelowna had a 2016 population of 151,957. The Kelowna metropolitan area population in 2016 is now at 194,882 making it one of the fastest growing metropolitan areas in Canada. Kelowna's population growth has been driven primarily by the movement of Canadians from BC and other provinces into this region, not by international immigration. Only 15.1% of the population is foreign born. On February 10, 2016, Statistics Canada declared the 3.1% Kelowna census metropolitan area growth rate as being the highest in Canada. Kelowna had a historic Chinatown in the area between Harvey Avenue and Leon Avenue, east of Abbott and west of Highway 97/Harvey Avenue. Historically most residents of this Chinatown were males. In 1909 15% of Kelowna's population was ethnic Chinese. In 1911 the percentage was the same. That year Sun Yat-sen visited Kelowna for fundraising purposes. In 1978 the final remaining traditional Chinese business ceased operations. By 2010 less than 1% of Kelowna's population was ethnic Chinese. A section of the façade of the rebuilt "Chinese Store" that was in Chinatown is now housed at the Kelowna Museum. Women make up nearly half of Kelowna’s homeless. In other Canadian cities, the overwhelming majority of homeless are males. On 12 May 2003, the Kelowna Homelessness Networking Group conducted a limited census, and enumerated 198 people: 54 individuals from the street and 144 individuals in shelters. On 24 February 2016, as part of the Government of Canada's Homelessness Partnering Strategy, the Central Okanagan Foundation conducted a coordinated Point-in-Time (PiT) Count of Kelowna's homeless population. The survey found at least 233 people were homeless, and another 273 were living in temporary housing. Kelowna faces severe suburbanization and urban sprawl promoted by the popularity of low-density car-oriented developments. As of 2007, Kelowna has the highest car dependency rate in Canada and has the second highest per-capita road transportation carbon footprint in British Columbia. Despite having a metro population of about 200,000, the greater Kelowna area is slightly bigger than that of Metro Vancouver. Road transportation accounts for more than 65% of total greenhouse gas emission in the city. The city is served by Highway 97 and Highway 33. Kelowna Regional Transit System is operated by FirstGroup, providing public bus transportation services in Kelowna and its vicinity. Funding for the transit system is shared between the City of Kelowna, Central Okanagan Regional District, District of Lake Country and BC Transit. Kelowna International Airport (IATA: YLW), north of the city core, is one of the busiest airports in Canada. There are regular flights to and from Calgary, Edmonton, Toronto, Vancouver, Victoria, Cranbrook, Whitehorse, Yellowknife, and Seattle, as well as seasonal service to Las Vegas, Phoenix, and Mexico. Emergency services are provided by the Kelowna General Hospital, the British Columbia Ambulance Service, Kelowna Fire Department, Central Okanagan Search and Rescue and the Royal Canadian Mounted Police. The Conseil scolaire francophone de la Colombie-Britannique operates one Francophone school: école de l'Anse-au-sable primary and secondary school. In February 2009 an RCMP gang task unit was approved to help deal with gang violence. Most crime in Kelowna is non-violent property crime. In 2012, Kelowna had the highest reported crime rate in Canada: 8,875 per 100,000. Police focused on crime in 2014, and Kelowna moved into the number four position across the country. In 2015, RCMP Supt. Nick Romanchuk stated, "I am absolutely convinced that as our drug enforcement numbers increase, our overall crime rate will decrease." As of 2016, the crime rate had returned to second highest in Canada. In 2017, the property crime in Kelowna rate went up six percent, once again the highest rate in Canada, while the drug crime rate fell two percent. In 2013, 446 victims of domestic violence were reported in Kelowna, earning the city the highest per-capita rate of domestic violence in British Columbia and the tenth-highest across Canada. This was a slight drop compared to 2011, when Kelowna reported the fourth-highest rate nationally and led the province in family violence. In 2014, Kelowna, there were 251 marijuana charges per 100,000 population, the highest per capita rate in Canada. In 2012, Kelowna had the highest crime rate of any metropolitan area in Canada, mainly because of its property crime. This increase has, however, been attributed[who?] mainly to the actions of a relative few known, prolific offenders. Illicit Drug use is high in the region. Between 2012 and 2016, Kelowna lead the country in cannabis, cocaine, and heroin possession. As of 2016, the crime rate has declined to second highest. In 2017, Kelowna had the highest opioid overdose rate in Canada. On November 4, 2015, The Canadian Institute of Planners announced winners of its fifth annual Great Places in Canada contest. A jury of seven professional planners named Stuart Park as the Great Public Space. "The jury was won over by the multiple strengths of the park — its everyday use, community focus, unique reflection of local character and natural environment, accessibility for multi-generational activities, and the significant role it already plays as a Great Space in Kelowna." ^ a b c d e f "Focus on Geography Series, 2016 Census". Statistics Canada. Statistics Canada. 23 April 2017. Retrieved 23 December 2017. ^ Canada, Government of Canada, Statistics. "Population and Dwelling Count Highlight Tables, 2016 Census". 12.statcan.gc.ca. ^ "Kelowna". Natural Resources Canada. 6 October 2016. ^ "Geographical Names of British Columbia". Nrcan.gc.ca. Archived from the original on 3 July 2013. Retrieved 18 July 2013. ^ "Population and dwelling counts, for census metropolitan areas and census agglomerations, 2011 and 2006 censuses". 12.statcan.gc.ca. Retrieved 12 November 2016. ^ "City of Kelowna" (PDF). Government of British Columbia. 2006. Retrieved 10 March 2013. ^ Ryan, Denise (26 May 2008). "Opening of William R. Bennett Bridge in Kelowna". The Vancouver Sun. Retrieved 19 February 2019. ^ "Stubbs House". City of Kelowna. ^ John D. Greenough, Murray A. Roed, ed. (2004). "Chapter 1: History of Geological Studies in the Okanagan Valley". Okanagan Geology. Kelowna Geology Committee. pp. 11–14. ISBN 0-9699795-2-5. ^ Strachan, Brady, "It could be a lot colder: Kelowna historian remembers Okanagan Lake freezing over completely", CBC British Columbia, Retrieved on 2018-04-19. ^ "Okanagan Mountain Park Fire 2003". Castanet.firewatch.net. 1 April 2004. Archived from the original on 20 September 2005. Retrieved 5 May 2011. ^ Canadian wildfires force thousands to flee homes | Canada | Reuters. Ca.reuters.com (19 July 2009). Retrieved on 2011-02-20. ^ McElroy, Justin. "New wildfire east of Kelowna, B.C., forces more than 1,000 people from their homes". CBC British Columbia. ^ "Kelowna's Official Flower: The Arrowleaf Balsamroot". KelownaNow.com. Retrieved 25 May 2018. ^ "Canadian Climate Normals or Averages 1981-2010". Environment Canada. Retrieved 24 April 2014. ^ "Castanet • Kelowna IS Semi-Arid? - View topic". Forums.castanet.net. Retrieved 12 November 2016. ^ "Daily Data Report for August 1998". Environment Canada. Archived from the original on 16 May 2013. Retrieved 13 February 2013. ^ a b "Canadian Climate Normals 1981-2010 Station Data, Kelowna Airport". Environment Canada. Retrieved 15 July 2015. ^ "Wind & weather statistics Kelowna Airport/Okanagan Lake - Windfinder". Windfinder.com. Retrieved 12 November 2016. ^ "Canadian Climate Information 1981-2010 KELOWNA A". Environment Canada. Retrieved 15 July 2015. ^ "Canadian Climate Data". Environment Canada. Retrieved 13 July 2016. ^ Google Maps (4 October 2018). "Map of Abbott Street, Kelowna, BC, Canada". Google. Retrieved 4 October 2018. ^ Nichols, Trevor (9 August 2016). "The problem in Kelowna's 'red zone'". Kelownanow.com. Retrieved 19 May 2017. It’s an area where many of the city’s most prolific criminal offenders hang out, and police constantly deal with drug trafficking, assaults and robberies there. ^ a b Hayes, Kelly (8 June 2007). "Red Zone Working: Cops". castanet. Retrieved 19 May 2017. The red-zone extends from Lake Okanagan to the West, Lake Avenue, Rowcliffe to Ethel and Ethel to Stockwell, Doyle and back to the lake. ^ McDonald, John (20 May 2016). "Red zone cleans up the streets but hinders recovery, addict says". Infotel.ca. Retrieved 7 July 2016. Reimer says he’s just an addict caught up in the spring sweep, an annual operation by police aimed at low-level street dealers and users where police make undercover buys and then arrest them. ^ McDonald, John (20 May 2016). "City councillor wants to know if red zone really keeps criminals out of downtown Kelowna". Infotel.ca. Retrieved 19 May 2017. Hodge says his own research shows the red zone in Kelowna was put in place in 1992, the direct result of surging street crime in the downtown core and demands from downtown businesses to do something about it. ^ Hayes, Kelly (9 June 2009). "RCMP doing some spring cleaning". castanet. Retrieved 31 May 2017. Head of the RCMP's Downtown Enforcement Unit, Mark Slade, says it's just the beginning. ^ "The History of Kelowna" (PDF). Learnforestry.com. Retrieved 27 December 2018. ^ "Example: Calona Vineyards – Awards – Artist Series Reserve VQA". Calonavineyards.ca. 6 January 1990. Archived from the original on 11 June 2011. Retrieved 5 May 2011. ^ Calona Private Reserve Archived 5 May 2009 at the Wayback Machine. Calonavineyards.ca (6 January 1990). Retrieved on 2011-02-20. ^ University of British Columbia, Okanagan Campus (23 October 2012). Facts and Figures Archived 8 July 2012 at the Wayback Machine. Retrieved on: 2013-02-07 UTC. ^ "6th Annual Demographia International Housing Affordability Survey: 2010" (PDF). Retrieved 5 May 2011. ^ "Flicka: Country Pride (Video 2012) - IMDb". IMDb.com. Retrieved 12 November 2016. ^ "FlowRider® Double". Waveloch.com. Retrieved 27 December 2018. ^ a b Kelowna Community Profile – Statistics Canada. 2002. 2001 Community Profiles. Released 27 June 2002. Last modified: 2005-11-30. Statistics Canada Catalogue no. 93F0053XIE. ^ "Population, Age characteristics, Dwellings, Houses, Language, Education, Work, Industry, Earnings, Income, Immigration, Citizenship, Labor". City-data.com. ^ "About Kelowna". City of Kelowna. 19 May 2016. Retrieved 27 December 2018. ^ a b c The Changing Face of Kelowna: Report on Ethnicity and Ethnic Relations Archived 13 July 2011 at the Wayback Machine. (PDF) . Retrieved on 2011-02-20. ^ "Canada's population estimates: Subprovincial areas, July 1, 2015" (PDF). Statistics Canada. 10 February 2016. Retrieved 3 January 2017. In 2014/2015, the population growth rate was 2.0% or higher in four CMAs: Kelowna (+3.1%), Calgary (+2.4%), Edmonton (+2.4%) and Saskatoon (+2.0%). ^ a b c "UBC students partner with City of Kelowna to recognize heritage sites" (Archive). University of British Columbia. 5 August 2010. Retrieved on 27 January 2015. ^ Hayes, Robert M. "Lum Lock and Quon Ho" (Archive). Kelowna Daily Courier. Circa March 2014. Retrieved on 27 January 2015. ^ a b Macauley, Thomas. "Old Kelowna Chinatown recognized as historic" (Archive). The Phoenix News. 18 October 2010. Retrieved on 26 January 2015. ^ "Heritage Building 1435 Water St - Chinese Store (Kelowna Museum, 470 Queensway) Archived 27 January 2015 at the Wayback Machine." City of Kelowna. Retrieved on 27 January 2015. ^ "Kelowna Homelessness Networking Group Report on the Census of Homeless Individuals in Kelowna Spring 2003" (PDF). Kelowna Homelessness Networking Group. Retrieved 22 May 2017. Women make up nearly half (48.1%) of Kelowna’s homeless, a somewhat surprising statistic. In most other cities, the overwhelming majority of homeless are males – in the most recent Calgary count, for example, only 16.5% of the over 1700 homeless individuals counted were females, meaning that, expressed as a percentage of total population, Kelowna’s female homeless population is almost three times as large as Calgary’s. ^ "Kelowna Homelessness Networking Group Report on the Census of Homeless Individuals in Kelowna Spring 2003" (PDF). Kelowna Homelessness Networking Group. Retrieved 22 May 2017. The census was conducted between the hours of 8:30 p.m. and 11:30 p.m. on Wednesday, March 12, 2003. The weather that day was generally overcast and cool, with daytime highs of 5º C and lows dropping to –3º C in the evening. ^ Sharp, Paul. "Kelowna Point-in-Time Count: Community Report" (PDF). Central Okanagan Foundation. Retrieved 22 May 2017. The Kelowna PiT Count was conducted on the evening of February 24th, 2016. The average temperature during the day was 9°C, with a low of -4°C. ^ Sharp, Paul. "Kelowna Point-in-Time Count: Community Report" (PDF). Central Okanagan Foundation. Retrieved 22 May 2017. A total of 233 individuals were identified as being absolutely homeless with 164 (70%) experiencing sheltered homelessness and 69 (30%) experiencing unsheltered homelessness. ^ Sharp, Paul. "Kelowna Point-in-Time Count: Community Report" (PDF). Central Okanagan Foundation. Retrieved 22 May 2017. A total of 273 individuals were identified as being temporarily housed in interim housing (n=231) or institutional care (n=42). ^ "Population of census metropolitan areas". Statcan.gc.ca. Retrieved 12 November 2016. ^ Google (18 October 2018). 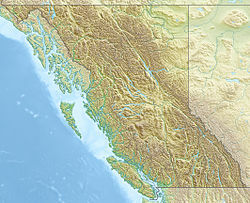 "Kelowna" (Map). Google Maps. Google. Retrieved 18 October 2018. ^ "Central Okanagan i-go, Transit". Kelowna.ca. Retrieved 12 November 2016. ^ "TeamPages: Okanagan All Stars - Okanagan All Stars". Okanaganallstars.com. Retrieved 12 November 2016. ^ "Hours and Locations - Okanagan Regional Library (ORL)". Orl.bc.ca. Retrieved 27 December 2018. ^ Special unit needed to fight Kelowna gang war: RCMP – British Columbia – CBC News. Cbc.ca (28 January 2009). Retrieved on 2011-02-20. ^ "Police-reported crime statistics, 2012" (PDF). Statcan.gc.ca. ^ Canada, Government of Canada, Statistics. "Police-reported Crime Severity Index and crime rate, by census metropolitan area". Statcan.gc.ca. ^ Moore, Wayne. "Canada's drug capital". Castanet.net. ^ a b "Kelowna ranks #2 in crime stats". Global News. 21 July 2016. Retrieved 3 January 2017. It isn’t the crime capital of Canada but Kelowna is still near the top of the list. ^ Moore, Wayne. "Tops in property, drug crime". Castanet.net. ^ "Domestic violence capital of BC - Kelowna News". Castanet.net. ^ Police report a pot possession incident every 9 minutes in Canada – CBC News. Cbc.ca (Sep 30, 2015). Retrieved on 2016-05-17. ^ "Crime rate spikes in Kelowna". The Globe and Mail. 25 July 2013. Retrieved 26 August 2013. ^ Wayne Moore (1 October 2015). "Canada's drug capital". castanet. Retrieved 22 December 2017. Kelowna has been tops among the 34 cities in marijuana possession for the past three years. The city has also been the No. 1 city when it comes to cocaine possession cases in three of the past four years. Victoria topped the list in 2011. Cases of heroin possession have been steadily increasing in the Kelowna CMA since 2010. Kelowna has been No. 1 the past four years. Possession related cases have risen from 5.5 in 2010 to 34.7 in 2014. ^ "Frustration mounts over fentanyl response in Kelowna". CBC News. 24 October 2017. Retrieved 23 December 2017. In September, a report from the Canadian Institute for Health Information showed Kelowna had the highest rate of hospitalizations for opiod poisoning in all of Canada. ^ "And the Winners of Great Places in Canada 2015 are … | CIP". Cip-icu.ca. Archived from the original on 20 November 2015. Retrieved 12 November 2016. ^ "Sister Cities". Kelowna.ca. Retrieved 26 September 2007. ^ Extreme high and low temperatures were recorded near downtown Kelowna from March 1899 to September 1962, at Kelowna CDA from October 1962 to September 1968, at Kelowna International Airport from October 1968 to December 2013, and at University of British Columbia Okanagan from December 2013 to present.